The above skeleton is of the salamander-like Apateon pedestris von Meyer 1840 from the Lower Permian of Odernhelm, Germany. There are just enough of these tiny little bones to show the ghostly outline of this freshwater amphibian. 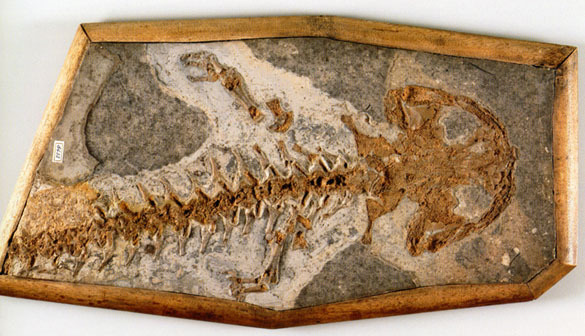 It is our only amphibian fossil at Wooster, and it is another gift from the George Chambers collection. Apateon pedestris is in the Order Temnospondyli, a group thought to be ancestral to the modern salamanders. They would have lived much like their descendants today, spending most of their time in creeks and streams and wet leaf litter. It grew to a maximum length of about nine centimeters. Its head was wide and flat, presumably to aid in swimming. Some specimens are preserved with soft tissues intact showing that this species had external gills as an adult, a classic example of paedomorphosis (as my History of Life students will tell you). The skull of our tiny specimen reminds me of a younger, larger and much more famous Miocene amphibian that went for a time under the surprising name Homo diluvii testis, meaning “evidence of a human at the time of the Noah’s Flood”. A drawing of the skeleton is shown above. 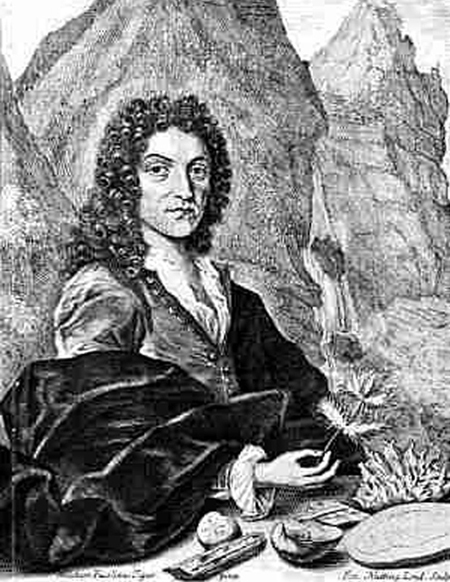 Johann Jakob Scheuchzer (above) described and interpreted Homo diluvii testis in Lithographia Helvetica (1726). He was convinced it represented a person (more likely a child) who was drowned in the Flood of Noah and then entombed in the sediments. The critical page from his book is shown below. Soften, thou stone, the heart of this wicked generation! Much later the famous French scientist Georges Cuvier (1769-1832) had at Scheuchzer’s fossil (above). He showed that it was, of course, an amphibian. The name for it now is Andrias scheuchzeri — a perpetual honor for its sincere but deluded discoverer. Fröbisch, N.B., Carroll, R.L. and Schoch, R.R. 2007. Limb ossification in the Paleozoic branchiosaurid Apateon (Temnospondyli) and the early evolution of preaxial dominance in tetrapod limb development. Evolution and Development 9: 69-75. Fröbisch, N.B. 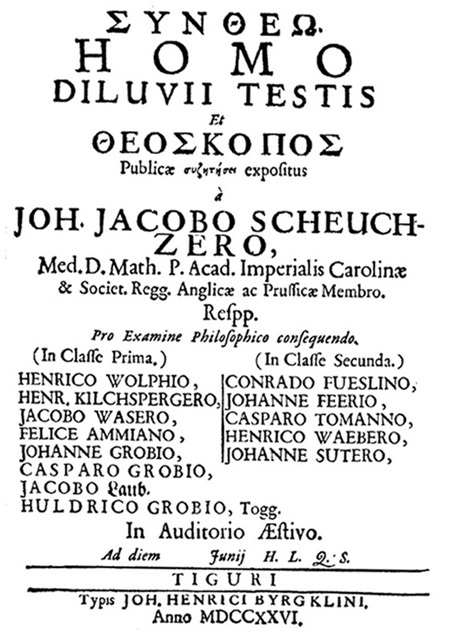 and Schoch, R.R. 2009. The largest specimen of Apateon and the life history pathway of neoteny in the Paleozoic temnospondyl family Branchiosauridae. Fossil Record 12: 83-90.